It’s tough to be a runner in New England when the deep snows come. Usual running routes become treacherous or impassable. Each day feels like a life-and-death search for safe places to get in a few miles. Runners in winter seek solid footing the way Wildebeest in the Serengeti seek drinking water. And when our search is fruitless, and when the forecast calls for more accumulation on top of the snow we’ve already endured, we sink into a funk and curse Mother Nature. As our options become more limited, our loops become smaller and more tedious. 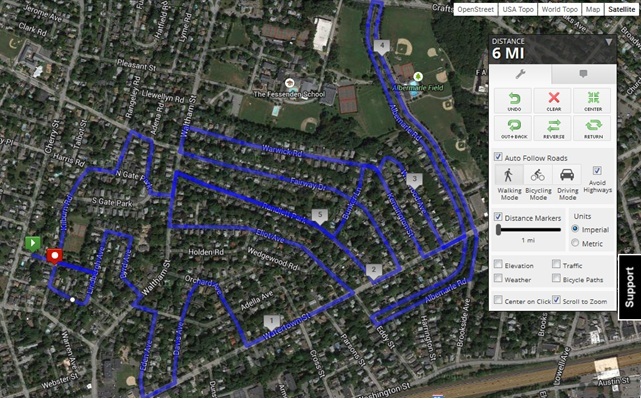 I have a six-mile “neighborhood run” (see map, above) that I do a few times every winter that takes advantage of lightly traveled side roads near my house. Another option is Comm Ave. in Newton, which has an access road with little traffic that is usually well-plowed. In the last week, I’ve done several runs that consisted of driving to, and then running back and forth on Comm Ave. But after a few weeks of such runs, I get pretty sick of these measures. What about indoor options? There’s no law that says you HAVE to run outside when the Governor has declared a snow emergency. That’s true, and if I belonged to a more sensible tribe, I’d simply head indoors at the first sign of trouble. But mostly I don’t. I know some people are happy to run on treadmills, and I admire them for it. But that just doesn’t feel like real running to me. So if I have to run indoors, I run and my loops get even smaller than laps of a parking lot. Anyone out there doing regular runs using any of the following? Maybe the only way to fight off the aggravation of small loops is to remember that not every athlete is inconvenienced by several feet of snow. As a runner’s world narrows, a skier’s world broadens. There have been plenty of winters with little snow, when Nordic skiers had little choice but to head over to the Weston Ski Center and traverse the same (man-made) 1k loop over and over. These days, they can ski just about anywhere they want to go. And I’m happy for them, I really am. I try to imagine how nice it would be to have the freedom to glide across the snow-swept landscape. Meanwhile, I look out the window of my office and survey the parking lot. Twenty times around should be about right. Thankfully the Minuteman bike path is nicely plowed and a short walk from my front door. A well-maintained, traffic-free, linear park for people who want to get off the couch and exercise? What kind of European-style socialist madness is this?! Funny thing — I was doing a double out and back on a snow covered back road, 5 degrees, more snow falling, and I remembered the guy who trained for the NYC marathon by running “indoor” loops while trapped underground after a mine collapse. I decided that I didn’t have it so bad.